GameCamp 2 is done. What a rush. I’m really pleased with the way it went, and judging by the reactions I’m seeing, a lot of other people liked it, too. I did get a chance to attend one or two sessions in there. My favourite was a session run by the inimitable Minkette, titled “We need to get more BOYS into gaming.” The premiss of the session was a fascinating one. The biggest growth area in gaming right now is in the farmville-type casual games market – where the average player is a middle-aged woman. This means that the bulk of gamers now are actually female and into casual games on the net, rather than hard-core-stuff-explodes flashy console games. The games most people see as mainstream – first person shooters and the like – are fast becoming actually already a niche product. But the hard-core explodey sort of game is what most gaming education is targeted at, and it’s also the sort of thing that most people who take game design degrees want to make. The discussion ranged widely through the state of education, and generally what it takes to make it in life. The session ended up for me with the thought that one of the defining features of adulthood is this: attaining the realization that reality is malleable. It’s the sort of conversational outcome that you just can’t plan or organize. That’s what the unconference format really brings out. I’m really proud of our work on GameCamp and the way the day went. Everyone I talked to seemed to have a good time and reading the tweets after the day has really been humbling. 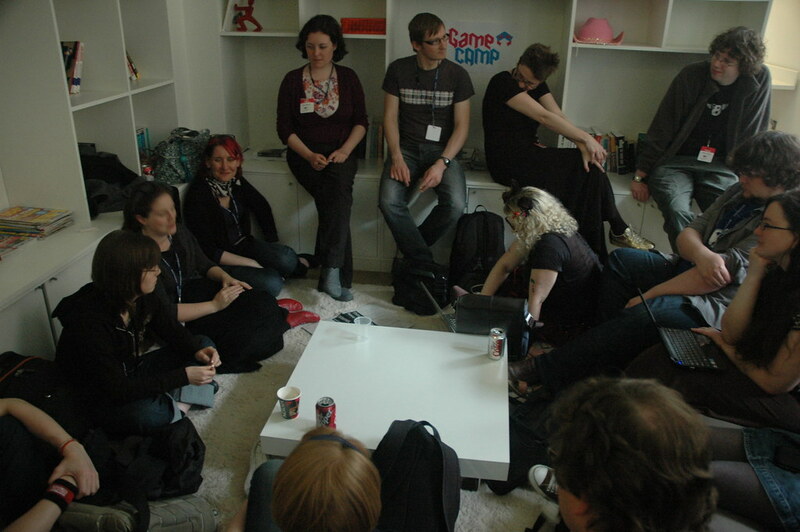 For me making GameCamp 2 happen has got a special resonance, because the first GameCamp was the first unconference I ever went to. That experience was the direct inspiration for the BeeBCamp series of unconferences that I then founded and organized at the BBC. So making this day happen was a bit of a return to source. The circle is now complete. Kieron Gillen gave a great write-up of the day on Rock, Paper, Shotgun. The guys at Mudlark and Lewis Denby have also shared their impressions of the day. Rain has also uploaded her pics of the day on Flickr. UPDATE: I’ve had a chance to upload my pics of the day. You can also read write-ups on their experiences from Jim Purbick, the guys at Just Race and Karl at Join The Company. UPDATE: Wired UK was also at GameCamp. Here’s their write-up. Huge thanks to our hosts at PayPal/eBay/Gumtree, who provided us with a splendid venue, and our sponsors at Unity and Pizza Express, who made sure we were well fed and watered. I’m really glad to have worked with the most awesome group organizing this: Rain Ashford, Desigan Chinniah, Rachel Clarke, Steve Green, Katy Lindemann, Mark Simpkins and James Wallis. Loads of people have suggested that we do this again, next year. What do you think?